All day long Monday, images poured into and out of the media of the million+ people who had quietly gathered in the Place de la Nation Square to show the world’s solidarity for the victims of the Paris terrorist attack. 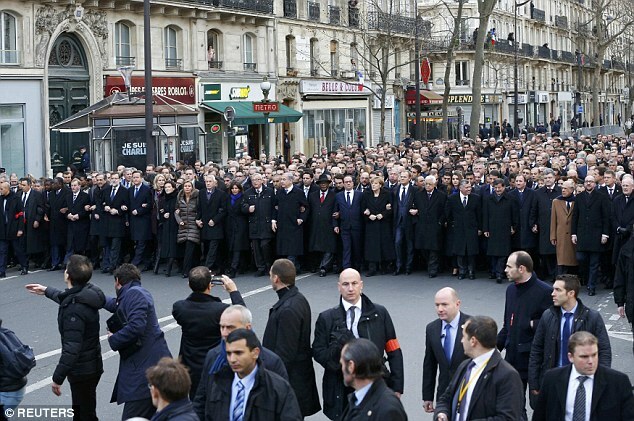 At the head of the marching throng were pictured 40 world leaders walking arm-in-arm. But what many saw was: Where is the President of the United States? Too short of a notice to get the President there, said the White House, given all the high security measures that would have been needed. It would have disrupted this important event. And yet, there was British Prime Minister David Cameron, and German Chancellor Angela Merkel, and Israeli Prime Minister Benjamin Netanyahu, and Palestinian Authority President Mahmoud Abbas, and the King Abdullah II of Jordan, and Russian Foreign Minister Sergey Lavrov, and the others. Their security teams pulled off their attendance on short notice. Worse, the scene lacked the presence of any top U.S. officials. That also stared everyone in the face. No U.S. Vice-President. No Secretary of State. Even Attorney General Eric Holder, who had been at a summit on terrorism in Paris that morning, did not take part. There were no senior cabinet officials either. Only U.S. Ambassador to France Jane Hartley and her staff were present. Fareed Zakaria, host of CNN’s “Global Public Square,” called the absence of top U.S. officials a “pathetic” mistake. I agree. “I thought this was why God invented Vice-Presidents,” Zakaria quipped. It’s true that the states represented their by their leaders at the Paris march don’t give a wit about the symbolic “message of the missing president.” The U.S. has been, is now, and shall remain adamantly united with them in their anti-terrorism policies. These leaders know that. Certainly France isn’t fussed about the symbolic message. After the Paris attack last week, President Obama made it a point to reassure French President Hollande of America’s solid partnership with its old ally France on the anti-terrorism front. Nevertheless, emotional symbols in foreign affairs, like doctrines and explanations, play roles outside the corridors of a state’s power, where they can evoke public responses that can settle in and alter perception. 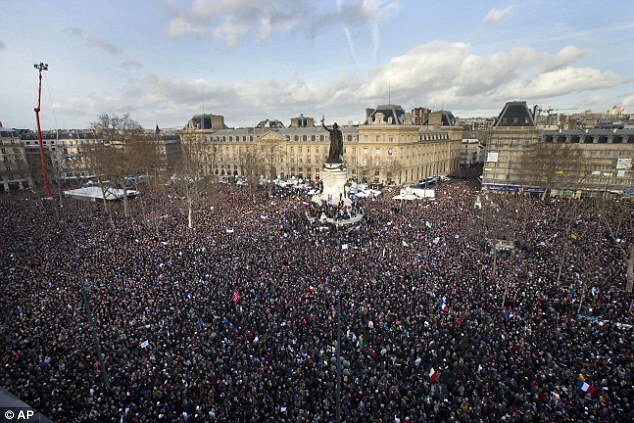 The Paris solidarity march carries such a high degree of symbolism that President Obama’s absence was a glaring image that negatively affected world opinion. For a state that lacks the street cred it had in the world before the war about Iraq, it was indeed a pathetic mistake. Top photo, AP. Bottom photo, Reuters. This entry was posted in INTERNATIONAL RELATIONS, MOODS & TUDES TODAY, THE SATURDAY POST and tagged Fareed Zakaria, Paris march, President Obama, world leaders march in Paris by Charles Strohmer (c) 2014. Bookmark the permalink. double standards for mr president? have you noticed no people behind the small crowd of security guys and aides, in the VIP march? I think they did not join the main meeting. Interesting. Nice catch, Alexandru. I hadn’t thought of that. Haven’t heard any journalists comment on it. May be story there, eh? If it’s true that they did not join the main march, that might be due to the high security measures. Or maybe they were walking in a different time frame or taking a different route than the main crowd (I saw a map that showed two official routes to the square). At any rate, they were there and our Pres was not.